Spectrum Noir All 4 24 piece marker/pen sets. Brights, Lights, Darks + Pastels MPN: SPECN-BRIGHTS24, SPECN-LIGHTS24, MPN: SPECN-DARKS24 and MPN: SPECN-PASTELS24. Spectrum Noir pens are alcohol ink based markers which have been designed specifically for crafters, but these affordable markers are also great for beginners, students and hobby artists alike. Each pen is double-ended, with a broad chisel nib for large area fills and a fine bullet tip for detailed work. The pens have a no slip rubberized grip for better control. These pens are refillable and even the nibs can be replaced if they become dull or worn, making them a wise investment and a low cost alternative to other brands. And their caps are double-layered for extended time between refills. This great value offering of 4 twenty-four pen box sets contains a spectrum of colors in Bright, Light, Dark and Patel shades, ensuring that you always have colors which work together. The colors blend seamlessly, and can be mixed or layered over each other. These fast drying, alcohol based markers are acid-free and non-toxic, and the colored ends of the pens allow for easy color identification. The image colors have been reproduced as accurately as possible but please understand that what you see on the end caps and your computer screen may be slightly off from the true marker color. Please note that these markers are 100% permanent and will stain items such as clothing and furniture and are unsuitable for children under 36 months. The "Brights" set includes the following colors that are not found in the smaller monochromatic sets: Light Green (LG) 5 Bright Pink (BP) 3, 4, 5 & 7 Coral (CR) 7 & 9 Orange (OR) 2 & 3 Dark Red (DR) 2 & 4 Fluorescent (FL) 1 & 2 Blue Turquoise (BT) 6 & 8 Ice Blue (IB) 3 Citrus Green (CG) 3 Jade Green (JG) 1 & 2 Green Turquoise (GT) 2 & 3 Pale Pink (PP) 6 Gold Brown (GB) 6 & 7 The "Lights" set includes the following colors that are not found in the smaller monochromatic sets: Light Green (LG) 3 & 4 Ice Grey (IG) 5 Green Grey (GG) 1 & 2 Tan (TN) 3, 4 & 5 Golden Brown (GB) 1, 3 & 4 Bright Pink (BP) 1 Pale Pink (PP) 4 Coral (CR) 1, 2, 4, 5 & 6 Brown Grey (BG) 3 & 5 Fluorescent (FL) 3 Citrus Green (CG) 4 True Blue (TB) 4 Ice Blue (IB) 2 The "Darks" set includes the following colors that are not found in the smaller monochromatic sets: Earth Brown (EB) 3, 4 & 6 Ice Grey (IG) 7 & 9 Brown Grey (BG) 7 & 9 Green Grey (GG) 3, 4 & 5 Dark Red (DR) 6 Blue Grey (BGR) 4 & 5 True Blue (TB) 7 & 8 Purple (PL) 3 Jade Green (JG) 3, 4, 5 & 7 Tan (TN) 6 & 9 Gold Brown (GB) 9 & 11 The "Pastels" set includes the following colors that are not found in the smaller monochromatic sets: Light Green (LG) 1 & 2 Flesh (FS) 1, 4, 5, 7, 8 & 9 Coral (CR) 3 Ice Grey (IG) 3 Light Yellow (LY) 1, 2 & 3 Blue Grey (BGR) 2 Hydrangea Blue (HB) 1, 2 & 3 Blue Turquoise (BT) 3 Dull Green (DG) 1 Ice Blue (IB) 1 Green Turquoise (GT) 1 Tan (TN) 1 Pale Pink (PP) 2 Gold Brown (GB) 2. Sorry, no international sales on this item. 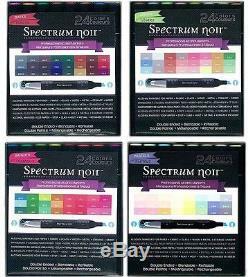 The item "96 Spectrum Noir Next Generation Alcohol Ink Markers/Pens, 4 24 Marker sets" is in sale since Saturday, April 30, 2016. This item is in the category "Crafts\Art Supplies\Drawing & Lettering Supplies\Art Pens & Markers". The seller is "leemcguire2001" and is located in Sterling Heights, Michigan.